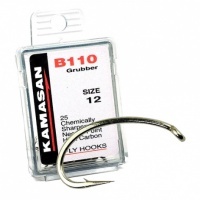 Kamasan B110 Grubber Hooks are a superb down eyed, forged bend, medium wire fly tying hook. A heavier version of the B100, especially suitable for buzzers. 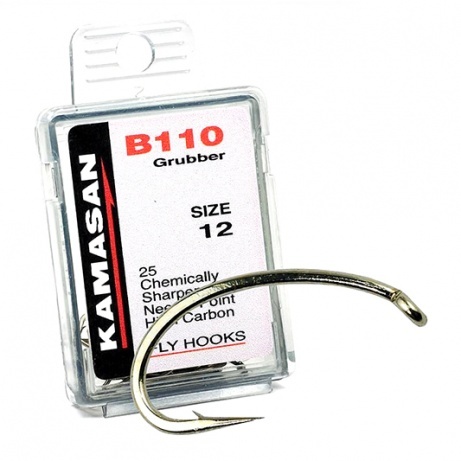 Kamasan B110 Grubber are superb fly tying hooks. Turned down eye, forged bend, medium wire, bronzed. A heavier version of the B100 theKamasan B110 grubber hooks are especially suitable for buzzers, nymphs and Czech nymphs where the need is for a heavy pattern coupled with a slim fly profile. 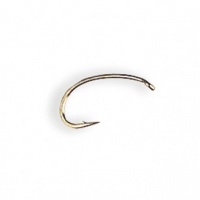 The straight eye on this little hook doesn't encroach on the gape making it the perfect hook for micro dry flies.